I really wish that it was mandatory to get a bread slicer with every new bread maker!! It honestly changed my life when I decided to invest in one and I couldn’t believe I’d not done it before. I’ll be taking a look at what you need to consider when looking for the best food slicer for bread in this post. A bread slicer helps to make all that hard work of making bread, whether you did it by hand or machine, much better as you get even slices which are much more pleasant to eat. They make better sandwiches, better toast, and if you’re worried about watching what you eat can help you moderate the size of your slices! You get much more out of your loaf too so you’re not wasting large crusts or making people eat bigger amounts so it should save you money overall. The other good thing about these electric slicers is that they aren’t solely for bread and so are multifunctional. You can use them to slice meat and cheese too. I don’t tend to use mine for cheese as I’m not a big cheese eater, but I definitely use it to slice up a roast beef joint or a ham hock. It can really make the meat go much farther, so excellent if you’re on a budget! Does it have specific bread blades? How easy is it to clean? This is a big one for me. Does it have a safety cut off? 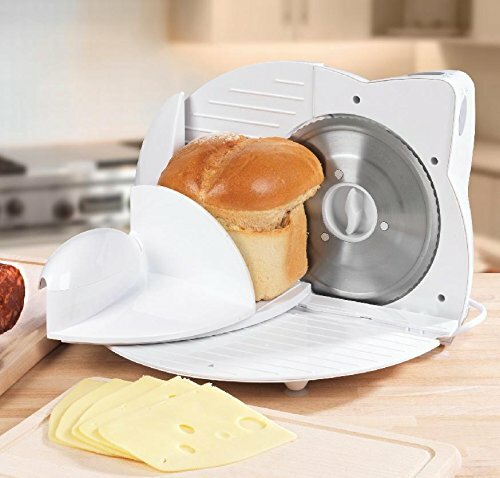 The bread slicer has 2 blades that are useful for cutting bread. There’s a universal blade and also a bread blade which is good when you’re wanting to cut a loaf you’ve just baked and is slightly more fluffy in texture. All in all this is a great value bread loaf slicer and my best choice of them all. If you’re just looking for the best cheap bread slicer this one from Swan should do you well. It’s very similar to one that I had a few years ago and I used it lots with no issues. What I really like about this bread cutting machine is the fact that it’s so compact and can be stored away easily as it folds up. This also means that the blade isn’t easily accessible when stored. It works fine for all breads and meats, I used to wait till my bread was completely cool before using it. It is one of the most expensive food slicers I’m reviewing, but it has some great reviews on Amazon (click the button below to see them) and if you want something that will stand out in your kitchen this would be the one to go with. 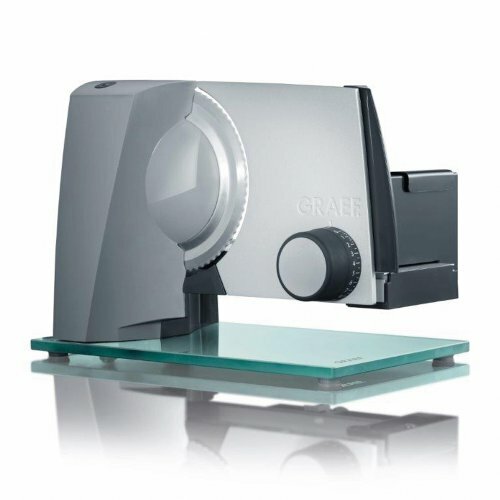 It cuts both breads and meats with ease and has an adjustable width blade so you can go from thick to thin easily. It’s a heavy and sturdy bit of kit too so won’t move around too much while cutting. Finally this is another positively reviewed bread slicer for home use. 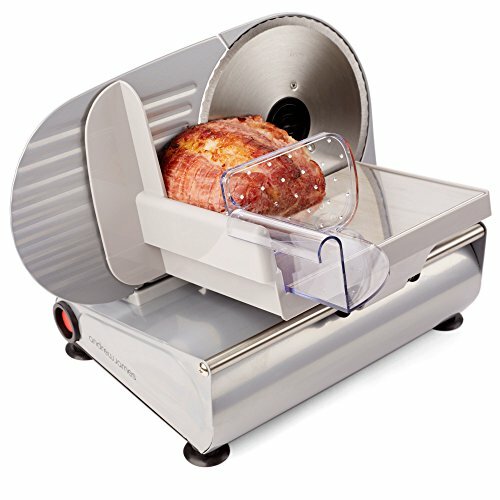 This one from Luvele is probably more suited as a meat slicer that also cuts bread so excellent if you’re wanting to do more than just make some sandwiches! It has a maximum cutting height of 13cm for loaves so if you make really tall loaves then it might not work so well for you. It’s easy to clean and is a sturdy machine. I like that you get the two different blades for cutting meats and bread too. 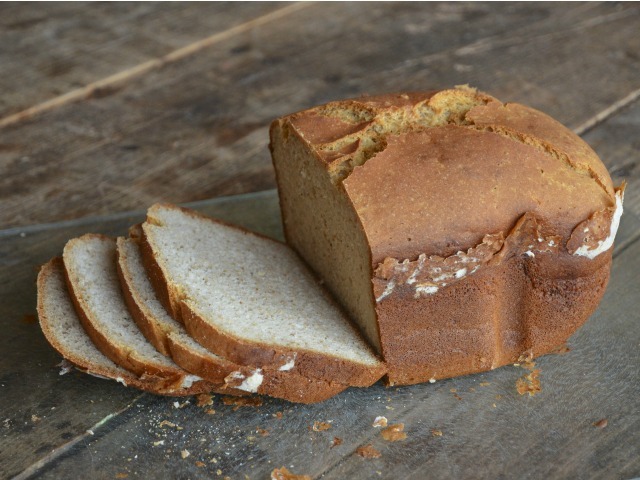 ← Bread making equipment list – the essentials and the nice to have stuff!